This beautiful monastery, specially known for its colourful festival, is one of the best places to visit for the Buddhist pilgrims, while in Ladakh. Also known as the lone place for the compassionate person, Chang-Chub-Sam-Ling in local language, this Gompa belongs to the Brokpa order and quite unusually holds a majority of women inhabitants. The hilly region of Hemis holds a distinct charm, and aura that is particular to Tibetan Buddhism in a natural and charismatic manner. The yearly festival or the birth anniversary of Guru Padmasambhava, is the union meet for the Ladakhis, who buy n sell artifacts in the market held in the occasion. The mask dance, unique and showcasing the Tibetan routes, is a spectacular occasion to enjoy a colourful break of life. Hemis is nearly 35 km, while the Gompa is nearly 45 km to the south of Leh, the capital of Ladakh, and on the southern bank of Indus river. The Hemis Gompa is situated inside the Hemis National Park, that is, itself a fantastic way to experience the wildlife and natural beauty. The Monastery is beautifully coloured and decorated in Tibetan style, with a huge courtyard, it serves as the dance floor during the annual birth anniversary festival of Guru Padmasambhava. The festival is a must see for every visitor who wants to explore a new dimension of life. 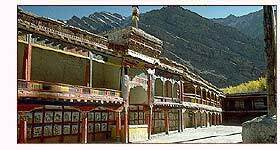 The Gompa is 350 years old and is considered one of the wealthiest monasteries in Ladakh. The monastery is specially decorated on the occasion of the Tse Shoe festival in the Tibetan lunar month. The festival brings together people from all over Ladakh and Tibet, due to its serenity and specialty. The colourful and hand woven dresses, the filled up markets with different objects makes it a shopping worthy festival. In the monastery, among many other antique objects, there is a structure of Buddha Shakyamuni, really exquisite and noteworthy. It is adorned with valuable gems and jewelry, making it an antique princely object. Hemis National Park - The park, covering an area of 600 sq. km, is full of vivid wildlife and caters to many rare birds, some of them migratory and from far away lands of the earth. Some landscape varieties to observe in the park include dry forests, birch and fir, alpine grasslands, and scrublands. 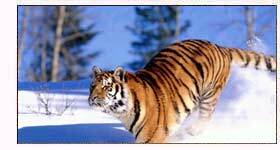 The rare species of animals that are found in the park include snow leopard, Tibetan Antelope, Serow, Ibex etc. Air - Srinagar is the nearest airport, connected to all major national cities. Leh airport can also be of used as it has some direct flights from Delhi; however, it depends on clouds whether the aircraft will land on time. Rail - The nearest train stoppage is Jammu, but train is not a very good option when the final destination is Hemis. Road - Road journey in Ladakh is itself an exciting opportunity. One can enter from the Himachal side, from Manali via Keylong, or otherwise, from the Kashmir side, from Srinagar via Kargil.